“Deception” by Brad Judy is available for purchase on Amazon. It can also be purchased at the book signing Feb. 9 at Farmhouse Kitchen in Ponderay. Courtesy photo. When Brad Judy began writing a biography about his late father, he never thought it would end up as a book filled with hunts for buried treasure, endless soul-searching and ultimately, betrayal. Life is funny like that. 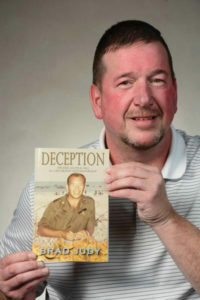 The former Sandpoint High School teacher will be selling and signing copies of his book, “Deception: the Rise and Final Fall of a decorated Vietnam Surgeon,” on Saturday, Feb. 9 at the Farmhouse Kitchen and Silo Bar in Ponderay. The signing begins at 5 p.m. and will wrap up around 8 p.m. Since Judy first published the nonfiction book, it has sold over 1,200 copies, an encouraging number for his first literary effort. “Deception” tells the story of Dr. Ken Judy, a man raised from nothing who became a decorated Vietnam veteran and later a renowned cardio-vascular surgeon. But, there was a more tragic side to Dr. Judy. He was raised by an abusive father, who beat him severely. After a violent episode, his mother took him and left, raising him in what could be described as a converted garage. Later, he fell victim to sexual abuse by a stranger, a crime that was overlooked by the authorities. Dr. Judy picked himself up from the ashes of a broken childhood and went on to graduate medical school at Loyola University Chicago. He ultimately joined the U.S. Army and was shipped off to a medical base in Da Nang, Vietnam in 1971, where he spent a year saving countless wounded G.I.s before returning home a decorated veteran. But, according to his son, Dr. Judy’s demons rode right alongside his achievements. He was a womanizer and serial philanderer. His mood swings and temper also became oppressive. In the book, Judy describes his father’s obsession with buying gold in secret and hiding it. Judy believes his father amassed two coffee cans worth of Krugerrands, which he estimated would be worth well over $2 million dollars in today’s dollars. It was years after Dr. Judy’s suspicious death in 1986 that Judy received a call from one of his father’s old friends that would turn into a treasure hunt for his father’s gold that was never recovered. Judy was told there might be $2-3 million worth of gold buried in his old family home. As Judy began searching for the lost gold, he uncovered what he believes may be the truth behind his father’s death, a truth that involves the ultimate betrayal by someone very close to his father. Without spoiling the ending, Judy’s writing manages to infect readers with his passion in “Deception.” It’s a book that is one part memorial to his father, another part treasure hunt for his father’s missing gold and ultimately, a final part deception, as he uncovers what he believes is the biggest secret behind his father’s death.